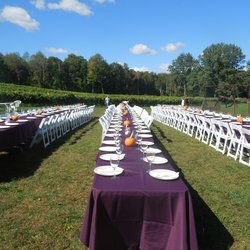 Our Farm to Table Harvest Dinner celebrates the harvest of our local farms. The entree will be served plated, with the sides served family style. Pesto Cheese Toasts – Garlic scape pesto combined with mild creamy goat cheese, topped with chopped heirloom tomatoes. Featured Farms – The Garlic Farm garlic, basil, tomatoes, Sweet Pea Cheese goat cheese. Short Ribs –slow braised short ribs in Lost Acres Vineyard Merlot and fresh stock over a base of carrots and onions. Served in their own sauce over creamy garlic mashed potatoes. Featured Farms – Maple View Farms short ribs, Lost Acres Vineyard herbs and wine, The Garlic Farm onions, Young Farm flour. Vegetable Lasagna – Homemade pasta noodles layered with fresh vegetables, cheese and a rich hearty tomato sauce. Featured Farms - The Garlic Farm eggplant, peppers, garlic, Blossoming Acres tomatoes, Lost Acres Vineyard herbs.